Nimbus analytical balances combine innovative design with a compact footprint, occupying minimal space whilst retaining a high level of performance. Suitable for advanced weighing in laboratories, universities, medical research and vets. The Nimbus base is formed from a single piece of extruded aluminum, a material that provides superior temperature regulation. The single-piece construction offers greater stability, producing highly repeatable results. The weighing sensor in the Nimbus is crafted from a single block, and contains fewer parts than a traditional force motor balance. This optimized internal mechanism is fabricated using hardened materials, helping the Nimbus tolerate rigorous laboratory use. For best results, we recommend using the Nimbus alongside our AVT anti-vibration table. 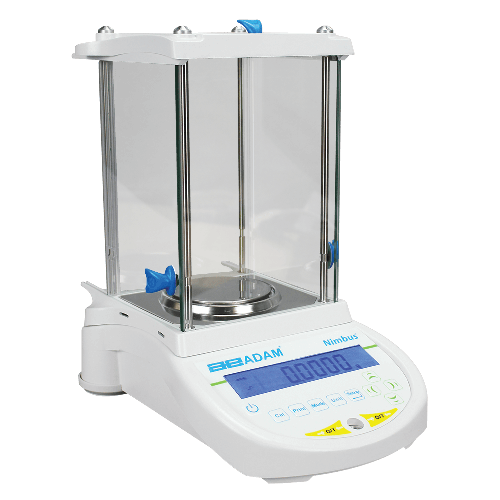 For more information about the Nimbus analytical balance, please contact us. A short guide to Adam Equipment's Nimbus series of analytical and precision balances. The Nimbus is well-suited to weighing chemicals in laboratory weighing experiments. If you've ever visited a jewelry shop, you've probably noticed that the jeweler keeps a scale handy. Jewelers rely on scales and balances to assess the quality of certain materials and to count gems. It’s common for weighing scales and balances to have multiple applications nowadays due to advances in weighing technology. Applications can range from checkweighing and parts counting to dynamic weighing just to name a few.